By invitation of C.W. Gormley, of the Shell-Beach-on-the-Bay, gulf club resort, across from the north end of Bay St. Louis, met a few evenings since and were entertained at luncheon. The distinguished visitors were shown over the place and viewed the extensive developments that have taken place within the past year or more. As it is to all who visit, the place and improvements were a revelation. The golf course is said to be one of the best planned in the country. A club house is in course of construction for members and their friends who will frequent the place, and yet to be constructed will be a great tourist hotel that will provide an attractive setting to the north Bay area. Aside from the liberal amount of Northern capital that has been spent on the proposition, including the purchase price, additional local capital of no mean magnitude has been supplemented and with new blood and other interests concerned, the plans as proposed will not only materialize in full detail, but other improvements will be added. The matter of building the bridge across the Bay of St. Louis, was incidentally brought up and there seemed to be a unanimous favor for the structure to strike the other side of the bay at Shell Beach. The reasons for this were based on practical ideas. It was discussed that the location of the bridge at the far north end of the bay would make such a structure immune from the destructive elements of wind and storm. And, secondly, a bridge of this kind could not be built too close to the present railroad bridge. It was further stated that Shell-Beach-on-the-Bay was isolated in a great measure, it was cut off from the outside world, and such an enterprise, standing for so much, would in time be not only a factor of great development but also one of the biggest revenue producers and one of the heaviest taxpayers, it was therefore entitled to consideration as the bridge terminus. But since the object of the visit was to show the place, its development and to get acquainted, the afternoon was dedicated to both pleasure and interest. However, Hon. E.. Adam, supervisor for the Pass Christian district, stated he would not commit himself to the bridge proposition. He stated that his people were not fully acquainted with the bridge bill as was recently passed by the Legislature, and of which his county would have to pay its proportionate share, but that in time he felt certain he would be able to voice their sentiments and wishes in the premises. He also stated that his county was pretty well up to the hilt in the matter of bond issues, but even then at the proper time, he intimated, that he would not shy on such a proposition of a bridge between the two counties for the ultimate good that would result. The site's history can be traced to 1850, when William A. Wittfield founded Shelley Plantation. Prior to that, stories of local residents tell of an early Indian tribe harvesting oysters and fish from the Bay waters. Mounds of oyster shells and burial mounds remained intact on the site for hundreds of years. 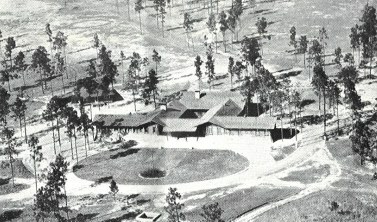 The plantation continued until 1924, when the land was purchased to build a luxury hotel, clubhouse and golf course, later named Pine Hills Lodge. 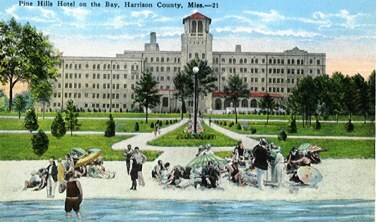 The $1.3-million hotel facility opened in 1926, but only a small portion of the 2,300-acre site was ever developed. 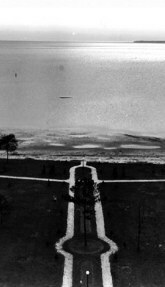 In 1983 Du Pont purchased the eighty-acre hotel site for two million dollars to be used as a "good neighbor" buffer zone between its manufacturing operations and the surrounding community.